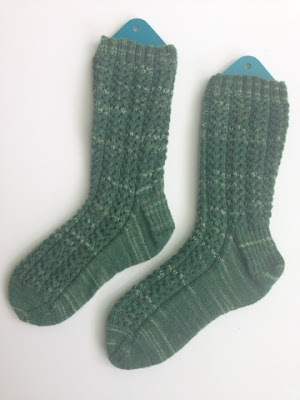 The second pair of Trellis Socks is finished. 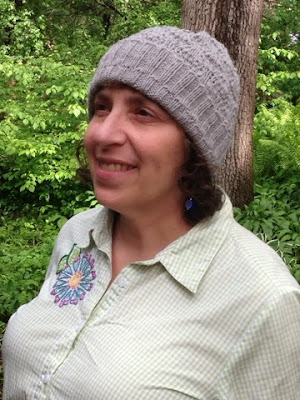 The next step is to get some better photos and then write it up as a free pattern. Both pairs I've made have been from Trekking XXL and it's a good pattern-yarn match. These are incredibly squishy socks. This is shaping up as a great weekend. My brother Michael is visiting from Washington, D.C. Tonight our parents took us out for dinner at a very sweet French bistro, where we laughed a lot and talked politics. It's hard not to talk politics in Wisconsin these days, at least for a teacher. Our governor's proposed budget includes a provision that would allow high school dropouts to be certified as special education teachers! Honestly. I am not making this up. I am not exaggerating. So much for all the time and money I spent getting my degree! It's a bit hard to say good-bye to a long weekend, but I have no choice so I'll be heading out into the real world this morning! Keith and I had a lazy weekend, but did get some yardwork and decluttering done. I started another hat that I have been hankering to make: Schwimmen by Shannon Cook. It requires a lot more attention than Gladys did. No TV watching while I'm making this one! It will be interesting to see if the result of all the extra work is a better hat than Gladys. I really, really like Gladys so that's a high bar. 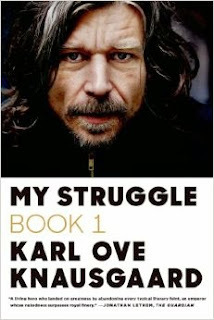 I finally finished My Struggle by Karl Ove Knausgaard, and I'm not sure what I think of it. The writing is amazing. Even in translation the prose alone carries you alone. He can be very philosophical in a good and readable way. And he is brutally honest about his own weaknesses and failures. The downside of this book is the length and the amount of detail. When he writes about running out for beer 20 years ago, he tells you what the clerk looked like, how much the beer cost, and what bills he handed over. How accurate is this? He's got to be filling in holes here. No one can remember that much. I really need to read more about this book -- and the other five that comprise part of the whole project -- to find out how much of it he made up. The thing is that all these details do contribute to an incredibly lifelike portrait of one man's life. I haven't decided if I'm going to read more. He spent a year teaching north of the Arctic Circle, an area that I'm fascinated by, so I'm tempted to read Volume IV when it comes out in paperback. 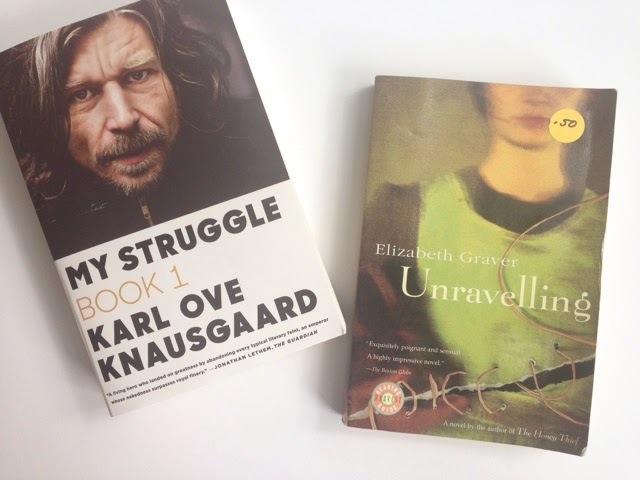 Tonight, I'm going to try Elizabeth Graver's Unravelling. I read it years ago and loved it. When I came across this copy at a library sale, I couldn't resist picking it up for 50 cents. It will be interesting to see how I like it so many years later. I'm joining up with Nicole. 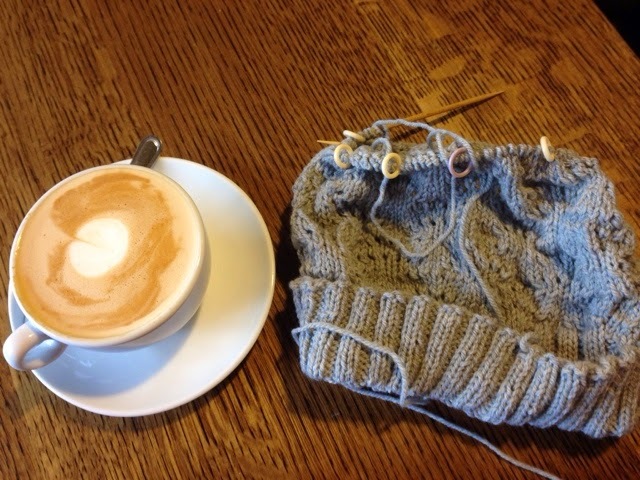 Come see what everyone else is knitting and reading! The pattern is an iron-on from Aunt Martha's, which you can find at just about any craft store. 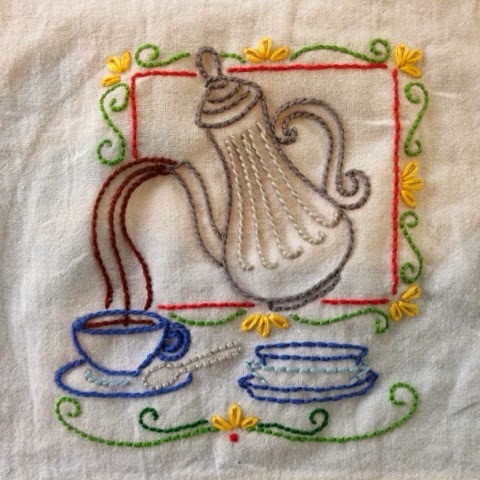 I did a little digging and found out that this company has been making iron-on embroidery patterns since the 1930s. I do find them very, very charming. I always stitch them with six strands of DMC thread. 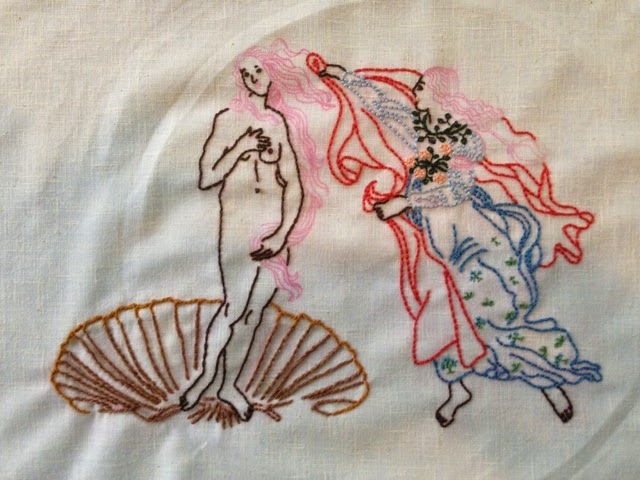 However, once I finish the part I've transferred, I'm going to take it in a direction that Botticelli never imagined. 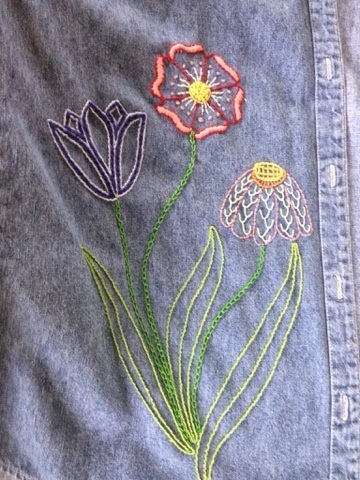 Thanks to those of you who commented on the embroidery on the shirt I was wearing in Friday's post. Yes, I did the embroidery, and it is my own design. I looked back and it seems like I said very little about it when I was working on it during the spring of 2014. I will have to do a whole post about it because it is one of my more successful projects! I know I'm looking forward to a third day of weekending. I hope you are have a lovely weekend! One downside of having a million or so WIPs is that you can go for a long time without finishing anything. I can't remember the last time I did an FO post. 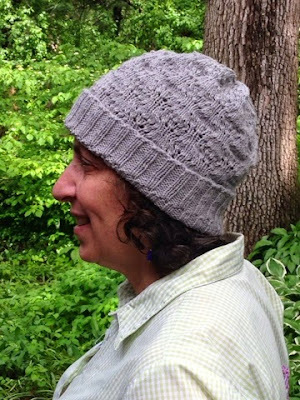 But hats are often quick projects, so here is Gladys. As you can see, I don't quite have the rim folded correctly. My photographer, also known as my husband, didn't notice, so I think I'll just blame him. Nonetheless, I think you can get the idea. I think it came out quite well. It's a really simple pattern that works well for socializing or watching TV. The pattern is from Quince & Co. and for once I used the called-for yarn, Chickadee (which just happens to be a Quince & Co. yarn; go figure). I really liked the yarn. It's kind of rustic without the roughness. I could definitely see making another one of these. I'm sure I'm not the only knitter who is excited about heading into a three-day weekend, even though we are expecting more rain. But I guess I shouldn't complain. I know there are a whole lot of people out there who would love to have all that rain. I'm looking forward to doing some reading, hanging out with friends and family, and, of course, knitting! Well, I'm home taking care of someone I love today. Also taking care of myself, apparently. I drank my usual two cups of coffee this morning and fell right back to sleep! Tomorrow will mark the one-month "anniversary" of this illness, and it's been a long month. I wish I could say that I'm an angel who tends to my loved one with infinite patience ... but I can't. I've had my moments of frustration and exhaustion. I guess all you can do is get up every morning and do your best. But it continues to give me lots of time for knitting. I'm finishing up the cotton yarn I bought, making The Almost Lost Dishcloth, which was recently popularized by Mereknits. 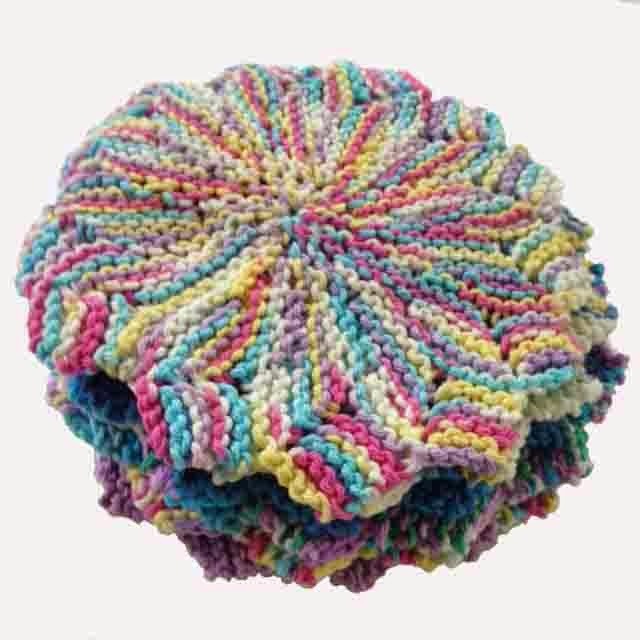 They are fun and fast knit. I'm planning on picking up some "gourmet" soaps to pair with the dishclothes as hostess gifts on my travels this summer. I can't cast off without also casting on, so here is my third pair of Hermoine's Everyday Socks. This has become my go-to pattern for mindless socks. I love the way it spices up stripey yarns. I took it with me to the School Board meeting on Monday night, so they are a good two inches longer than in this picture, which I took on Sunday. I went to the meeting because my district, like many others, is trying to reduce suspensions and expulsions. It's a worthy goal that I genuinely believe in, but the implementation is messy and many teachers feel the new plan has made behavior worse. Sigh. I guess that anything worth doing is challenging. 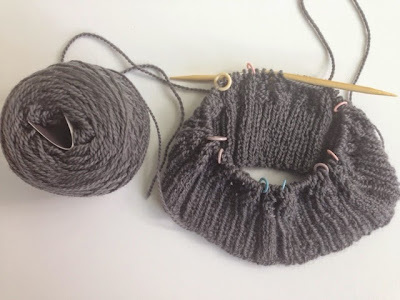 Don't forget to check and see what everyone else is up to with Nicole's Keep Calm and Craft On and Ginny's Yarn Along. 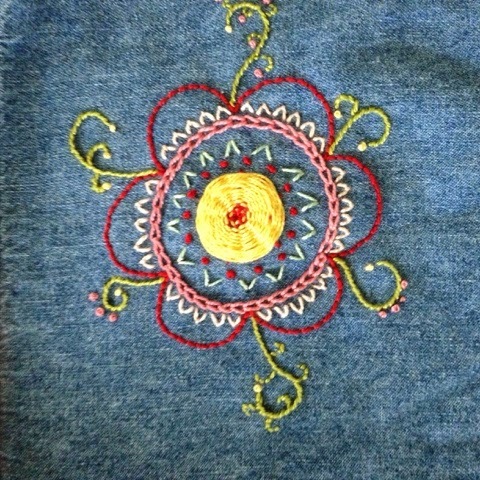 The shirt, like most of the things I embroider, is from Goodwill, but the patterns are all my own. I used DMC Perle size 5 for the first time, and I liked it. It makes a nice bold image and the strands don't tangle. I just recently realized that the colors are numbered the same as the regular six-strand floss. I liked this flower, which I put on the back. The spiderweb-stitch center really packs a punch. This skein of Three Irish Girls yarn is destined to be a Pebble Beach Shawl, a pattern that was gifted to me by the amazing knitter-blogger Deb. 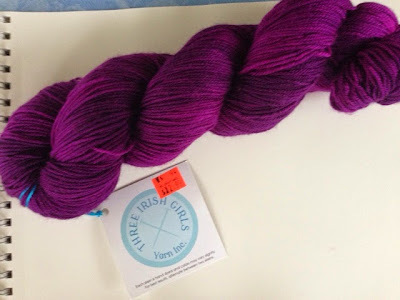 Three Irish Girls yarns are squishy and richly colored, just wonderful to work with, and they are dyed right here in Wisconsin. They are actually dyed in Superior, Wis., which is something like a 6 hour drive, but still, they're Wisconsin girls! The latte is decaf -- even Caffeine Girl has her limits -- and the hat is Gladys, a free pattern from Quince and Co. I'm knitting it in the called-for yarn, Quince's Chickadee. At the moment, I am liking the yarn more than the pattern. 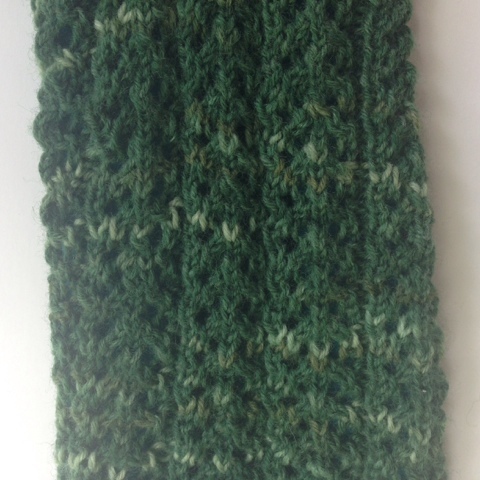 The yarn has a rustic look, but without the roughness that often comes with that type of yarn. Chickadee is really quite soft. The lace pattern doesn't show up at all, at least not so far. Obviously I'm hoping that blocking with change that. Has anyone else tried My Struggle? It's an odd book, the first of a six-volume set. 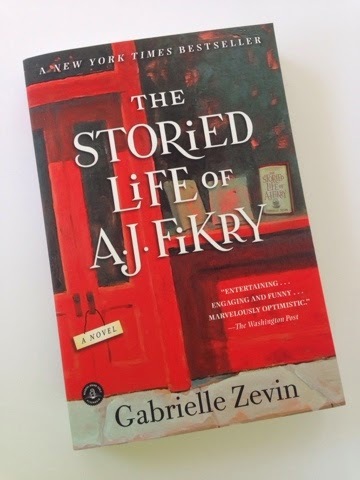 It's an autobiography written like a novel and has been compared to Proust's fictional In Search of Lost Time. I hit page 100 last night and I'm still not sure how I feel about it. The writing is incredible, but the amount of detail is overwhelming. I'm thinking I'll like it more when the author gets a little older. At the point where I'm reading, he's a teen-ager and there's a lot of teen-boy angst. Despite my ambiguous feelings, I'm not ready to give it up? I'll be checking with Keep Calm and Craft On. 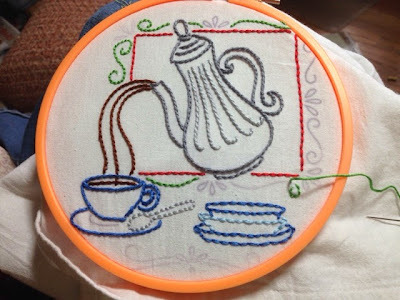 Stitching On Sunday: Coffee Anyone? It has been a windy, cloudy weekend, which I hate in spring. For one thing, I need to get out and start shaping up that mess we call the yard, and it's just too cold for me. Instead, I've had lots of time for crafting, embroidering mostly. I'm trying to finish up the flour-sack towels that I had ironed designs on. Then they'll all be ready for the holiday season! I love being ready ahead of time. Why is taking care of a sick person so exhausting? I slept through the night last night then napped this morning from 10 until 11:30. That is ridiculous! 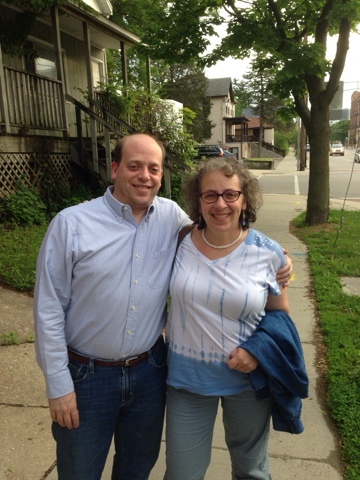 We went out to breakfast with Keith's parents and we're going to my parents' for dinner. The best part of the day is that Seth will be joining us for dinner. He survived 7 finals and finished his first year in vet school! 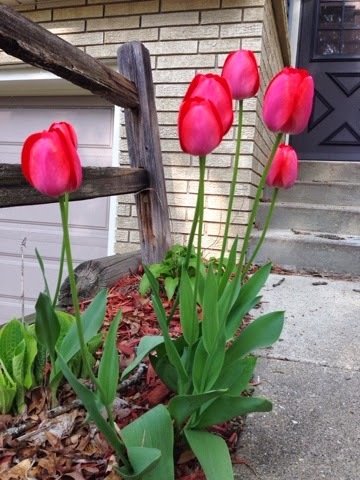 Despite the gray skies, spring is officially here; the tulips are out! I've been working on this sock forever. It's a Trellis, my own design, so you think I'd fly right through it, but that hasn't been the case. 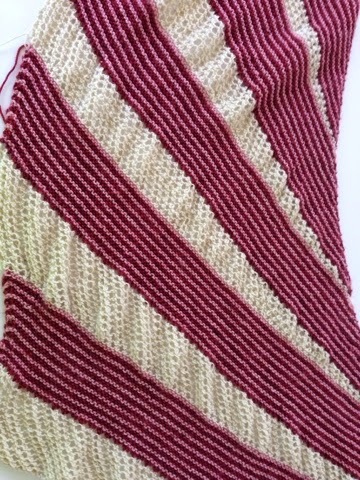 I love the way this pattern looks, but I find the stitches to be fairly slow. I now have one green sock (destined to be a gift pair) and now a pink/red one for me. I think I'm going to knit the 2nd green one next, just for variety. The dark areas on the pink/red sock still bother me, but at least they aren't this dramatic in real life. 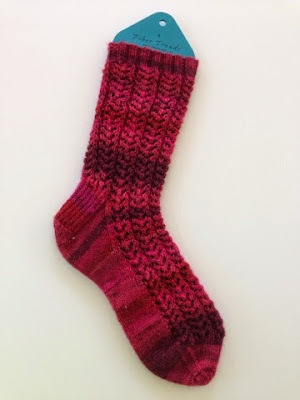 Just like these socks move along one stitch at a time, so go the days with my "loved one." Some are better than others, but most days are hard. I'm back to working contract hours at school, but I can't put in the extra hours I usually do so I'm worried about getting everything done on time! I picked up this book because it sounded kind of fun, like it would be a good distraction. A couple bloggers mentioned that it was fun to pick out all the literary references -- and I'm a sucker for literary references. The story about a widowed bookstore owner and his daughter presents lots of opportunities to mention titles and characters -- and that is fun. However, the story is a bit formulaic for my taste, pretty predictable. If you like fun and frothy books, pick this one up. But if, like me, you like your books to have more substance, I'd say pass on this one. I'm joining up with Nicole at Frontier Dreams. ... blog friends matter. Thank all of you so much for your kind words and support. Your messages mean a lot to me. My "loved one" (for lack of a better word) is not doing very well, at least not yet. It is going to take weeks, possibly months. The doctors in the hospital were not at all helpful, but I was able to find a private practitioner who has gotten treatment going. I am really happy with the pattern and my color choice. So there's one little mood booster!